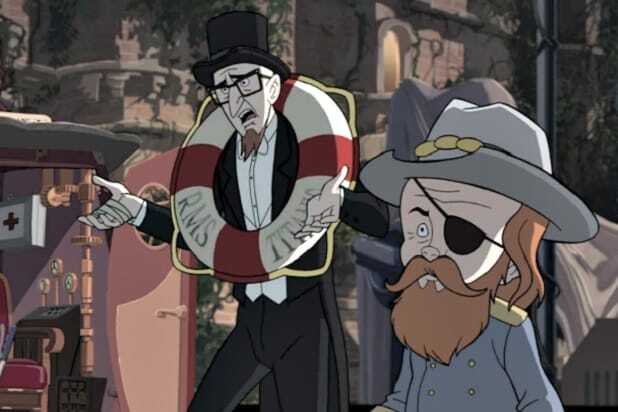 'The Venture Bros': Wait, Is Time Travel at the Center of Everything? Season 7 of “The Venture Bros.” has already had a ton of callbacks to past seasons, turning what felt like throw-away gags into suddenly-relevant lore or character details. But in the season’s penultimate episode, “The Forecast Manufacturer,” a callback teases a huge possibility for the entire series — that the universe in which it takes place has been the wrong one all along. In “The Forecast Manufacturer” the eastern seaboard has been hit by a devastating blizzard caused by a weather control machine being operated by rogue supervillain The Creep (James Adomian). Creep used to be a member of the Guild of Calamitous Intent, but defected to its rival Canadian organization, the Peril Partnership, and thus The Mighty Monarch (Christopher McCulloch) and Henchman 21 (Doc Hammer) are dispatched by the Guild to infiltrate the Creep’s base and kill him. When they arrive, they learn that the weather machine is actually just one of several devices Creep has stolen from the Guild on his way out. Among them, Grover Cleveland’s Presidential Time Machine, a Victorian-era wardrobe with a bust of the 22nd/24th President on top. That, yes, is also a time machine. If that reference went over your head, it’s OK. Grover Cleveland’s Presidential Time Machine was last seen all the way back in Season 1’s “Are You There God? It’s Me, Dean,” where it was mainly just a funny joke (why Cleveland, of all presidents?). It was just something Monarch essentially stole from Rusty Venture (James Urbaniak) and, we now know, handed over to the Guild, and was never mentioned again. But just minutes after its reappearance in Season 7, it comes into play, and shakes up the entire “Venture Bros.” continuity in the process. While the Monarch and 21 are fighting Creep (by playing “Dive Bomb” with illegal lawn darts), the time machine suddenly turns on of its own accord and out step two familiar figures: Rusty and Billy Quizboy (Hammer). Rusty is dressed like a passenger on the Titanic (complete with a life preserver from the doomed ship), while Billy sports a Union army uniform (and beard) from the American Civil War. From their dialogue, we can piece together a few things about them, starting with the fact that they’re not “our” Rusty and Billy. See, throughout “The Forecast Manufacturer,” Rusty and Billy were on their own mission to stop the blizzard. But their story only tangentially involves the Creep and never intersects with the Monarch and Henchman 21. Which means — you guessed it — the Rusty and Billy who emerged from Grover Cleveland’s Presidential Time Machine are time travelers. Though they’re only onscreen for a few moments, Time Traveler Rusty and Billy reveal a few very significant things about their situation before they go. First: They’ve been using the time machine regularly to go to different eras — which is a likely explanation for the costumes. Second: They think they’re in the prehistoric era when they arrive, and immediately determine that the Creep is a caveman. We’ve only heard the Monarch referred to by his real name, Malcolm, a couple of times in the entire run of the show, and it certainly takes him by surprise here. “Did that douche just call me Malcolm?” he asks after Time Traveling Rusty and Billy disappear. Why? One possibility is that Time Traveler Rusty is from the future, after he and The Monarch have set aside their differences and, perhaps, become friends. But the line about going back “even farther” seems to be a clue that something much huger is in play: Time Traveling Rusty is from a completely different version of history, one in which Rusty and the Monarch haven’t been arch enemies since college. In fact, everything we’ve seen in “The Venture Bros.” throughout all seven seasons may well be the unintended, “A Sound of Thunder”-like consequences of their time stream misadventures. In “A Sound of Thunder,” Ray Bradbury’s classic sci-fi story, a time traveler accidentally changes history when he steps on a butterfly during a trip to the Mesozoic era. That butterfly’s death alters the timeline in both subtle and extremely drastic ways (including basic language syntax and kind of government) as the effects of the change ripple out through history. By the same token, Time Traveling Rusty and Billy appear to have been making some big changes of their own – and The Mighty Monarch, after all, named himself after the species of, you guessed it, butterfly. What those changes have been or might be is still really speculative. What’s worse is that judging from Rusty’s addressing of The Monarch by his real name, he and Time Traveler Billy may also be completely unaware of the larger effects they’ve had on the timeline. They at least don’t even seem to know exactly when they are. But either way, we think it’s clear that Time Traveling Rusty and Billy are in fact the original Rusty and Billy, and the versions we’ve seen since the very first episode are time travel-created duplicates. That would explain a lot of still-unresolved plot threads, like how Rusty and Malcolm were childhood pals but somehow don’t remember. It might even be what created the Monarch to start with. And if there’s something in the story that the time travel plot point could readily serve, it’s the ongoing relationship between Rusty and the Monarch. We’ve seen that relationship grow, evolve, decay, regress, and grow again over the last seven seasons. What we don’t know about it is why it exists at all. Maybe Grover Cleveland’s Presidential Time Machine will finally give fans the answers they’ve been wondering about, and give a sense of where Rusty and the Monarch are headed as they progress into the future. Even the episode’s title, “The Forecast Manufacturer,” seems like an allusion to time travel, rather than the more obvious joke about the weather machine at the center of the story. If Time Traveler Rusty is trying to “manufacture” the “forecast” of events, and failing, that could have serious implications for the show going forward. At minimum, we have to ask just how much of Rusty’s personal and professional failings, not to mention his deep-rooted character flaws, stem from his having screwed things up for himself via time travel hijinks. After all, we’ve already seen an alternate universe version of Rusty who was competent, creative, and wildly successful (and who the Rusty we know once tried to kill and replace). What if this universe’s Rusty isn’t just a trans-dimensionally anomalous screwup, but an actual screwup? But does this mean “The Venture Bros.” is headed for a literal reboot? Maybe, maybe not. One thing that’s certain, if Season 7 has shown us anything it’s that “The Venture Bros.” isn’t beholden to any of its lore. The season started with a three-episode arc about the Monarch’s father, the Blue Morpho (Paul F. Thompkins), and Rusty’s father, Dr. Jonas Venture (Paul Boocock), that upended a ton of the show’s core backstory. Both were show to be still alive — and then promptly killed so the show could get back to more current stories with its main characters. So while the presence of time travelers from alternate timelines messing up events seems like a big deal, it’s important to remember that show creators Jackson Publick (AKA Christopher McCulloch) and Doc Hammer are willing to set up major points like this, complete them, and throw them out the window just for a good punch line. Stay tuned, in other words. And don’t step on any butterflies. The hazard of traveling through time attempting to preserve history in “Timeless” is the many opportunities to mess up. 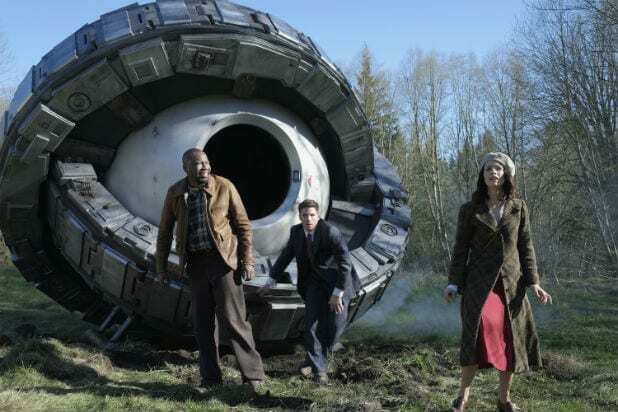 The show’s protagonists, Lucy (Abigail Spencer), Rufus (Malcolm Barrett) and Wyatt (Matt Lanter), are always one step behind villain Garcia Flynn (Goran Višnjić) as he gallivants across American history. And even when they're successful in stopping his plans, they have a tendency to alter history as we know it in some fundamental ways. Here is every single change “Timeless” has made to the history of America, in order from most mundane to most widespread. Flynn heads to Las Vegas in an attempt to steal a nuclear weapon. The Time Team worries he's going to set it off (or later give it to the Nazis), but Flynn just uses it to power his time machine. Apparently the U.S. misplacing a nuclear warhead in the 1960s had no lasting repercussions. Actress Hedy Lamarr wasn't just beautiful and talented, she was also a brainiac inventor. That's not quite common knowledge in our timeline, but Rufus tipped Hedy off before leaving 1940s Hollywood about filing her a patent on her invention of a radio guidance system for torpedoes. The U.S. government winds up using it, making her a ton of money, but more importantly, getting her recognition for her efforts that she sorely deserved. In 1920s Paris, Flynn shoots down the Spirit of St. Louis just miles before Lindbergh is set to land in Paris and complete the first solo transatlantic flight in history. Nothing much changes, though -- Lindbergh's fame is delayed by a few weeks after the crash, but he still shows up to claim his fame and fortune. And he still becomes a vocal Nazi sympathizer, despite Lucy's best efforts to convince him Nazis are not so good. With a careful bit of evidence destruction, Flynn prevents Eliot Ness and the Untouchables from making their tax evasion case against Capone. Ness winds up murdered more than 20 years too early. Still, the Time Team still manages to bring down Capone without much additional bloodshed, so not much goes differently. That Kevin Costner/Sean Connery movie is presumably a little different, though. The changes in Lucy's life are pretty widespread when she gets home from the first mission. She loses a sister but gains a fiancé she's never met. It's mostly just awkward, and then Lucy doesn't talk to him for the rest of the season. Until, that is, he's expedient for plot purposes in the finale. Flynn and pals attempted to sabotage the Apollo 11 moon landing from Mission Control, but were stopped along the way by the Time Team. In the meantime, Flynn slipped off, found his own mother, and saved his half-brother he'd never met from dying of anaphylactic shock as a child. This one doesn't have many ripples, but it does show that Flynn is sometimes a good dude. The big trauma in Wyatt's life is that he had a fight with his wife, Jessica, and let her get out of their car on the side of the road. That was the last time he ever saw her -- until a random change to the timeline brought her back. Wyatt's been trying to make the marriage work despite almost starting a relationship with Lucy, so Jessica's arrival has had a big impact on the time team, at least. Rittenhouse did their best to put a stop to the creation of rock and roll by killing blues musician Robert Johnson. The Time Team saved him, but not his producer, leading billionaire industrialist and Johnson superfan Connor Mason to record the historic album instead. Alice Paul was a key figure in the Women's Suffrage movement, but Rittenhouse managed to assassinate her. With Lucy's help, Grace Humiston stepped into the suffragette role and managed to get the attention of President Woodrow Wilson to support the 19th Amendment. History survived Paul's death without much changing. After accidentally interfering with a Barrow Gang bank robbery, Lucy and Wyatt hang out with Bonnie and Clyde for a bit. The time traveler interference changes how the pair meet their grisly end, with a posse of police descending on them in their cabin, rather than ambushing them on the road. The change robbed Whiskey Pete's Casino in Nevada of the famous bullet-riddled car the bandits originally died in. Flynn rewrites history by killing Lt. Col. William Travis at the Alamo before he can complete his famous letter. Lucy takes up the task of penning a document key to Texas history and, basically, makes it up as she goes along. Everyone, including Davy Crockett and James Bowie, still dies at the Alamo and Texas is still a thing, so the overall effect is minimal. Flynn attempts to help John Wilkes Booth be even more successful in assassinating Abraham Lincoln, adding Army General Ulysses S. Grant, Vice President Andrew Johnson and Secretary of State William Seward. The Time Team stops the additional murders, and Flynn only succeeds in being the guy who offs Lincoln instead of Booth. With the Time Team helping, Flynn grabs Benedict Arnold, a founding member of the evil Rittenhouse organization, and uses him to try to assassinate the other founders. Arnold gets shot and dies, getting some traitor comeuppance. In our history, Arnold betrayed George Washington and then escaped to England to live happily ever after, dying roughly two decades later. Flynn returns to the Old West and interferes with Jesse James' assassination. He recruits James as a guide, and in the process they add a few more folks to James' body count. James still buys it with a bullet in the back, but his historical assassin, Robert Ford, never goes on to become "the coward Robert Ford," because he winds up dead, too. After messing around at the Hindenburg disaster in 1937 and saving all its victims, Lucy returns home to find the show's most meaningful time travel ripple: her cancer-suffering mother is now healthy, and her previously alive sister was never born. This one is personally devastating for Lucy and, what's worse, nobody knows how it happened or how to fix it. After a Rittenhouse assassination attempt, a young John F. Kennedy wound up transported to the present by the Time Team. He got loose, did some partying, and discovered he was essential to American history. Rufus warned Kennedy about his assassination in Dallas 1963, but it only added a small amount of time to his life -- instead, he was assassinated in Austin. Nothing else changes, though. America's first serial killer, H. H. Holmes, created an elaborate hotel that later was dubbed the "murder castle." Holmes would kill people in the building throughout the World's Columbian Exposition in 1893 (and before and after), but Wyatt shot and killed him three years before he would otherwise have been captured and hanged. Stealing the time machine, Wyatt and Rufus travel back to 1983 to prevent the meeting of the parents of the man who supposedly would one day kill Wyatt's wife. The plan is to just prevent the future parents from hooking up, but Wyatt ends up causing the father's accidental death. It's still a success, since two of the killer's victims are still alive in 2017 -- just not Wyatt's wife. The infamous disaster ("Oh, the humanity!") doesn't happen when the Hindenburg arrives in New York. Flynn intervenes, altering the series of freak accidents that causes a spark to ignite the airship's huge hydrogen balloon. The upshot is the Time Team manages to save just about everyone who otherwise would have died in the disaster. In World War II, the Time Team hooks up with Sir Ian Fleming while he's an undercover spy. Claiming to be CIA operatives, they try to stop Flynn. Fleming uses the inspiration for a Bond novel that never existed in our timeline, called "Weapons of Choice." Time travel creates a new Bond movie, which rules. The Time Team chased Rittenhouse to Salem to keep them from adding Ben Franklin's mother Abiah to the list of victims of the infamous Witch Trials. That would have messed up the early years of the United States, so the Time Team wound up putting a stop to the Salem Witch Trials and saving all its victims, erasing one of America's darkest moments from its history. If you're a fan of "Timeless," check out these 12 other time travel shows you should definitely be watching.